Counts 1,000 Bills Per Minute!!! Includes UV AND Magnetic Counterfeit Detection!!! The Royal Sovereign Electric Digital Bill Counter counts 1,000 bills per minute. Just load 130 bills in the hopper for fast counting and sorting. The Counterfeit Detection feature includes both ultraviolet (UV) and magnetic (MG) counterfeit detection. 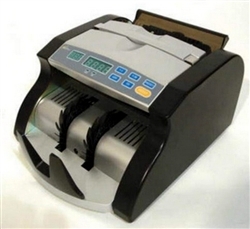 The bill counter features an auto start/stop and 4-digit LED display. The batching option (1-999) comes in handy when you want to count bills fast in preparation for bank deposits. - Dimensions: 9" x 11" x 6"